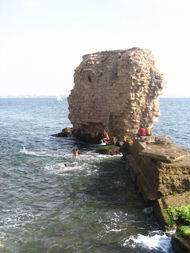 Acre was an important port city in ancient times. The modern marina is located where the ancient port used to be - on the southern side of the old city. 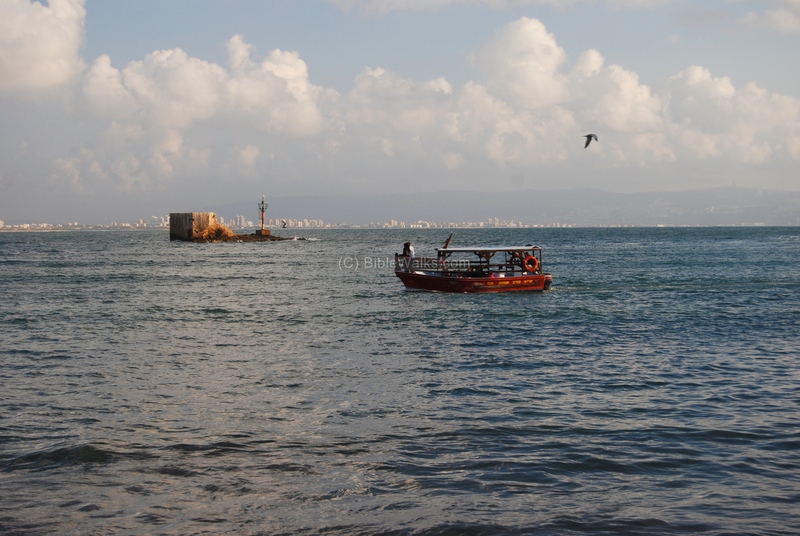 Acre was established as a port city, and became one of the most important cities in the ancient history of Israel. 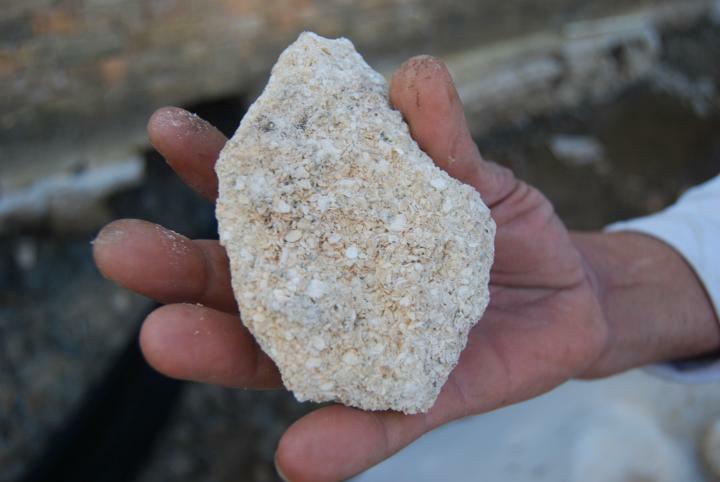 Most of the goods produced in ancient times in the Galilee were exported from here to Rome and to other cities around the Mediterranean. 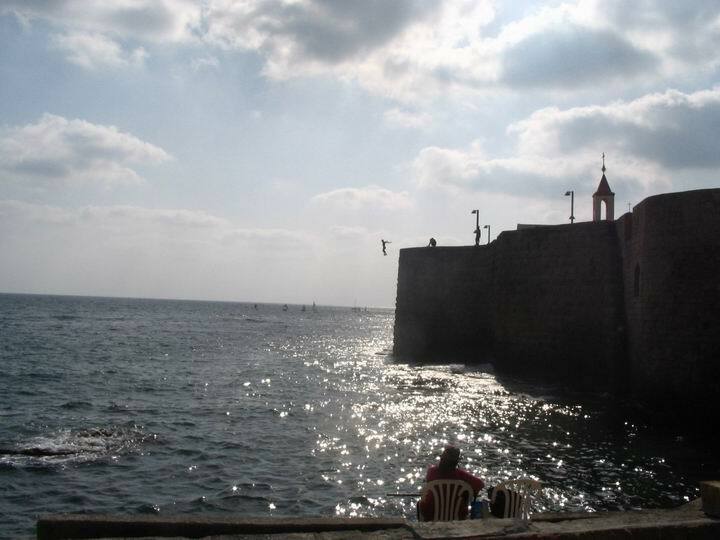 The port is located on the south side of the old city of Acre. It was built during the Persian times (6-4thC BC), and is still in use today as a marina. The following photo shows an aerial view of the port, which occupies the eastern half of the image. The submerged parts of the ancient ports can be also seen on the left side. The two Khans (Umdan, Shawarda) used to be inner ports, as explained below. Pointing on purple points will automatically scroll to the relevant photo, text or web page. There are limited parking spaces near the port, so you can leave your car outside the land gate, or in the center of the old city in the parking lot. Drive, or walk, to the port from the land gate, along the road on the eastern walls, reaching the southern tip of the old city. Alternative path will be by walking through the market until you get to Khan al-Umdan which is adjacent to the port. Yet another pathway is walking along the south walls from the light-house. 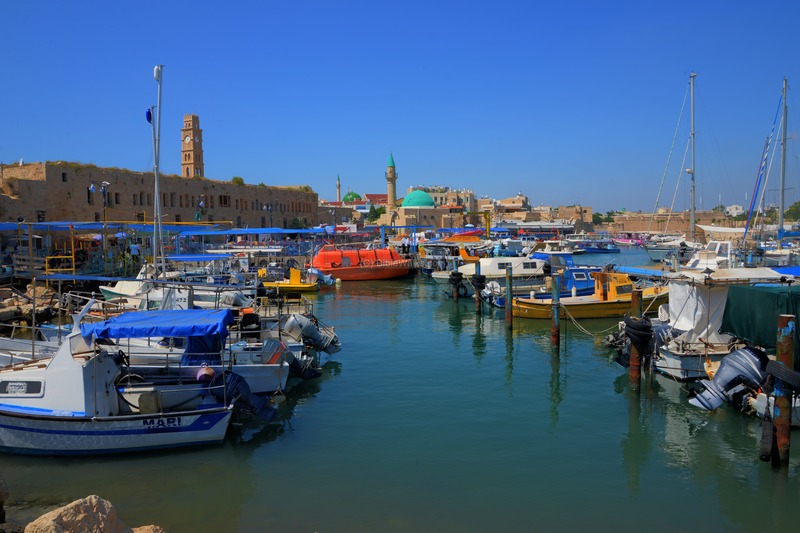 During the Persian period (6th-4thC AD) the harbor was relocated from Tell-Akko, which is located in the mouth of the Na'aman river, to the present location. The Phoenicians, the leading seamen in the Mediterranean, operated the ancient port, as well as many other ports in the shores of Israel. Recent excavations (4/2009) traced the location of the Hellenistic port to the south-east side of the present walls. In the Roman/Byzantine period, Acre was an important port city. It minted its own coins, and its harbor was one of the main gates to the land. Through this port the Roman Legions came by ship to crush the Jewish revolt in 67AD. 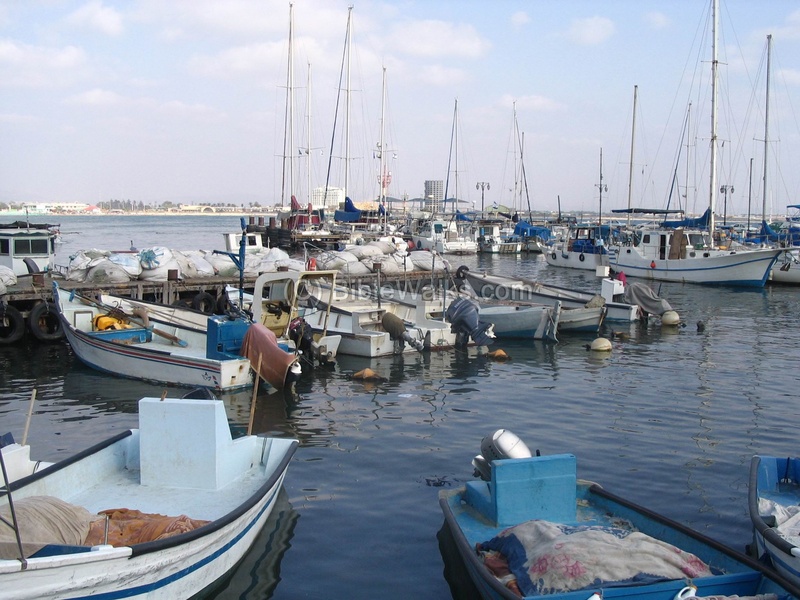 It also served was used as connections to the other ports (for example, Caesarea and Jaffa). The port of Acre (Ptolemais) was a station on Paul's naval travel, as described in Acts of the Gospels (21, 6-7): "And when we had taken our leave one of another, we took ship; and they returned home again. And when we had finished our course from Tyre, we came to Ptolemais, and saluted the brethren, and abode with them one day". 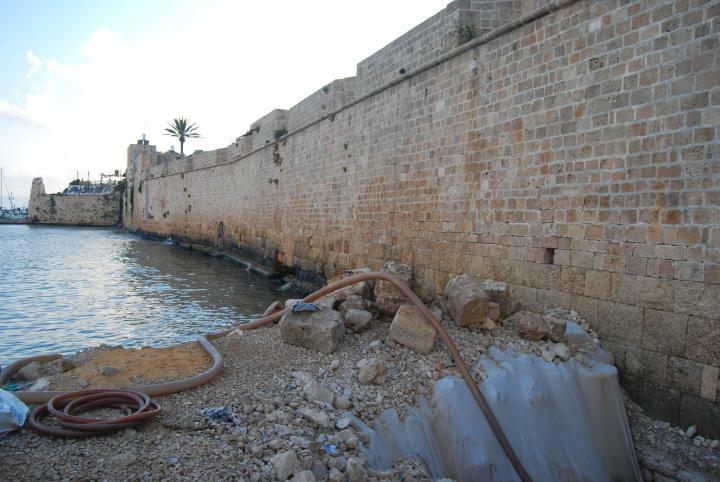 At the Arab period the harbor was renewed and enlarged, including the eastern breakwater. This construction at the times of Abu-Tulun at about 880AD. In the Crusaders times (12th-13th C AD), Acre was their stronghold in the Holy land, and their control lasted years (until 1291AD) after the fall of the Crusaders Kingdom. The harbor was their important way in and out to the Holy land, and was a rich commercial port which exported the products of the Kingdom. In the city there were many Europeans, including seamen and merchants from the mainland - from Venice, Genoa and Pisa. Each of these Italian cities had their own neighborhoods. During the Mamluk period (1250-1517AD) the coastal cities were destroyed by the rulers, since they wanted to avoid an invasion from the west, and lacked the naval power to resist. The port was small and few merchant ships visited the ruined city. There was a small Venetian colony in Khan el-Franaj, north to the port. The city and its port continued to be a small port under the Ottomans (1517- 1920AD). The main change was their consent for foreign residents who were allowed to establish a merchant colony in Khan el-Franaj. Only in the 18th C the city started restorations by Daher el-Omar, who ruled the Galilee. He ruled the city from 1749 until he was shot by Ahmed Jezzer Pasha in 1775. The latter continued the restoration of Acre and its buildings, such as Khan al-Umdan - which was part of the port facilities and built over part of the inner port. Napoleon tried to capture the city in 1799. Jezzer Pasha, with the help of the British ship under the command of Admiral Sidney Smith, managed to defeat the French army. Another naval war was fought in 1840 against General Ibrahim Pasha, who captured the city. A combined fleet of British, Austrian and Turkish ships (a total of 21) heavily bombarded the city, defeated Pasha, and returned the Turkish Ottomans back to power. Today the port is used as a marina for yachts and fishermen boats. 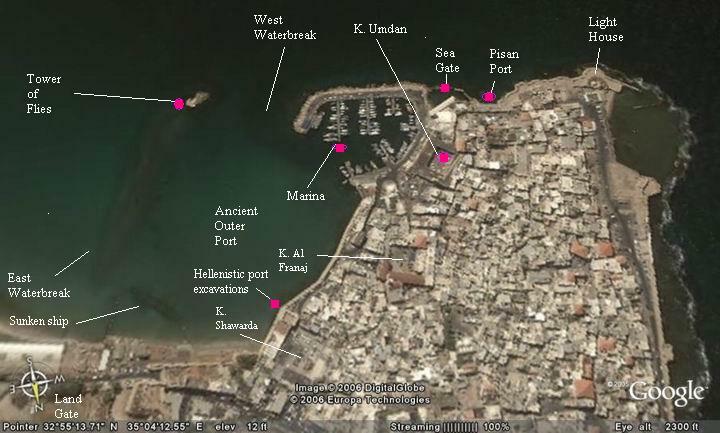 two inner ports in the area of the old city: one was a civilian port, the other for military ships. One inner port was located in the area of Khan al-Umdan which is located west to the modern marina. The other inner port was located at the site of Khan esh-Shawarda, closer to the land gate. The use of the dual inner ports was the same plan as another famous Phoenician port - Carthage. the western, built by the Phoenicians, starts from the sea gate and continues until the "tower of flies", which was a fortified tower. It is mostly submerged, but can be seen in the aerial photo above. The eastern pier, built in the 10thC AD by the Arab Tuluns, is now under the sea, but can be seen in the aerial photo above on the right side. The sea gate is located on the south side of the old city, where the Abu-Christo restaurant is located today. Walking up the stairs on the left will get you to the wall walkway, and you can reach the lighthouse on the south-west corner facing the sea. A closer look on the tower that was part of the sea gate. Today it is used as a pool for the local boys. At the Arab and Crusaders period the tower was used as a bridge over the entrance to the inner port. A heavy iron chain was used to seal the entrance at nights in order to protect the ships that anchored in the inner port. The Pisan port was one of the foreign harbors, and is located near the sea gate. The photo below is taken from the side of the sea gate, looking west. In the background is the tower of the church of Saint John. 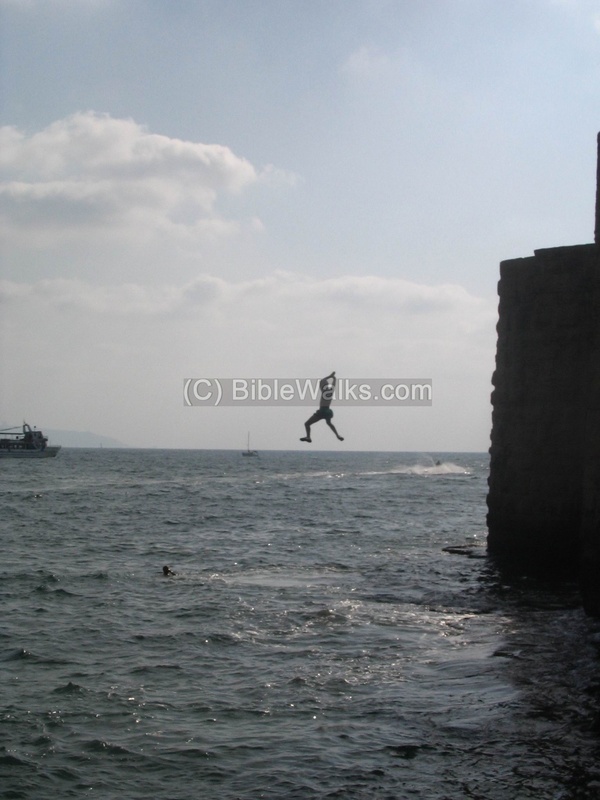 As can be seen in the previous photo and the one below, the walls are used in the summer time by the local boys as a jumping point into the waters below. 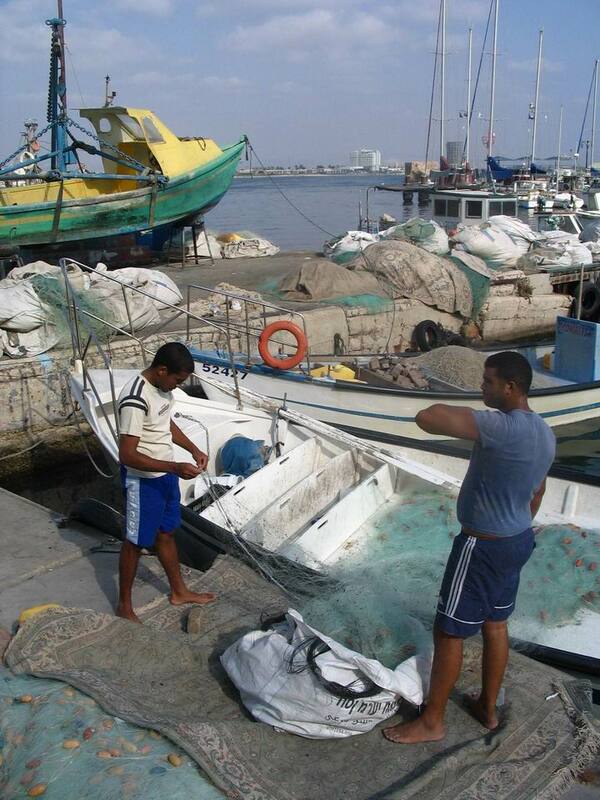 The fishermen operate several boats in the marina. They can be seen mending their nets, sailing out the the open sea, and transferring the catch to the market nearby. The marina hosts yachts, motor boats. There is also a tourist ship that makes round cruises around the walls of the old city. Another view of the port, with Khan al-Umdan and its clock tower on the left background, El-Jazar Mosque in the center background, and Al-Bahr Mosque (the sea mosque) to its right. The latter mosque is used for prayers by the fishermen. 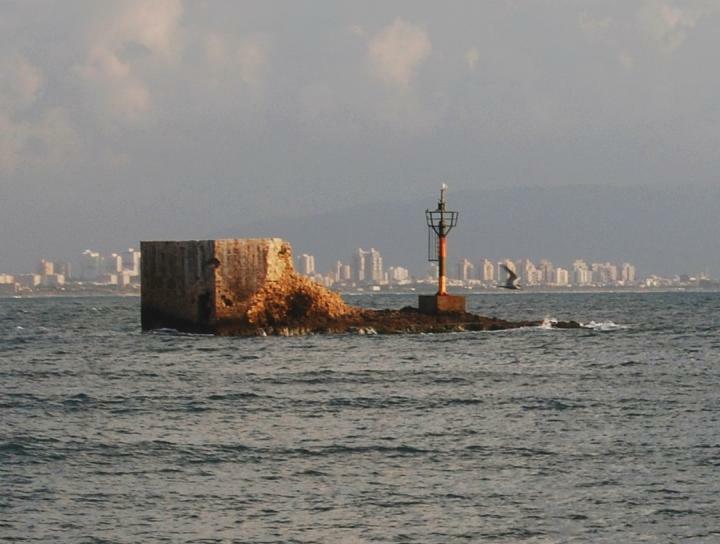 On the east side of the modern port, deep in the water, is the western side of the ancient Phoenician breakwater. It was called the "tower of flies" by the Crusaders, who mistook Acre as the biblical Ekron (as per Kings 2: 1 " Is it not because there is not a God in Israel, that ye go to enquire of Baalzebub the god of Ekron?..."). Since zebub means in Hebrew "fly", this tower got its name from this misinterpretation. 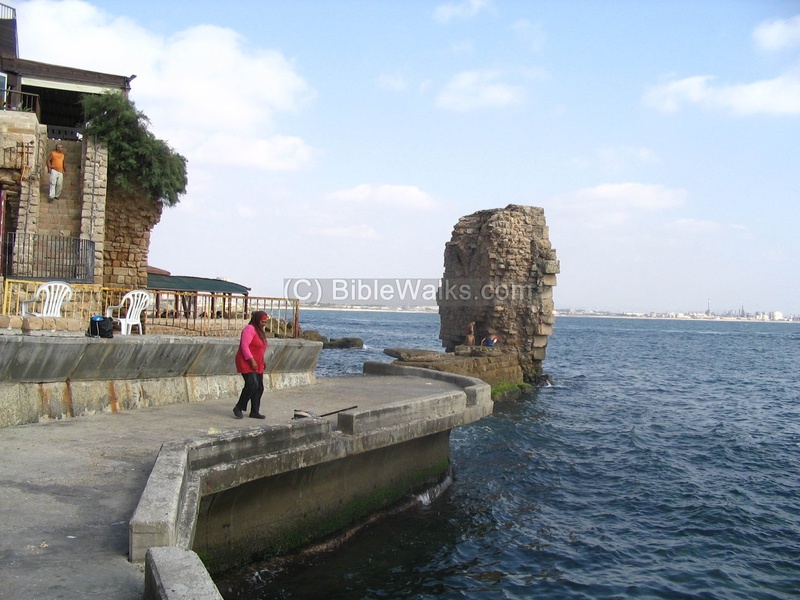 The tower was used by the Crusaders as a lighthouse, and is called in Arabic "Manara" - lighthouse. A modern light pole is located on site, as seen below. In the far background behind the tower - the residential houses in the Krayot of Haifa, and behind them is mount Carmel. 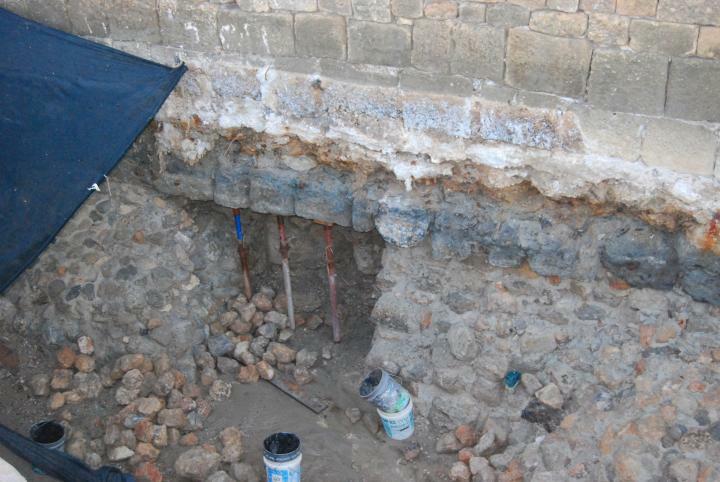 Recent excavations (2009) discovered the Hellenistic-period pier, located one meter underwater along the eastern walls. A 15M section along the wall was dredged using a makeshift rampart. The waters between the rampart and the walls were pumped out, as seen in the photo below. 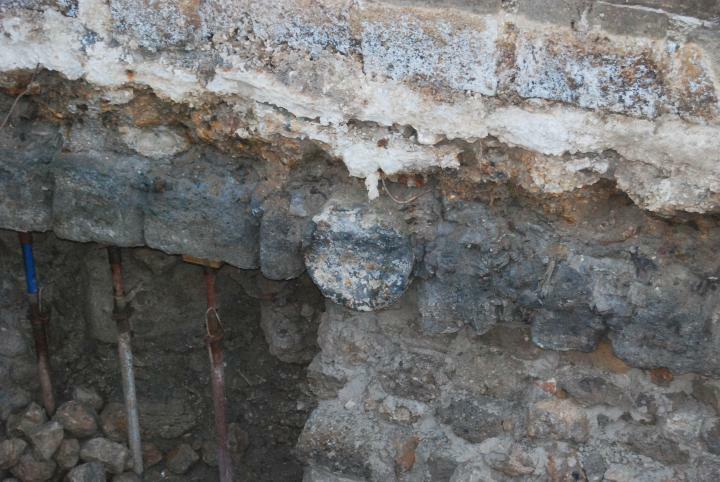 This allowed the archaeologists to view and treat the ancient walls, reinforcing some parts in order to prevent it to collapse. Along the present walls are various layers - the Ottoman walls on top, British-made cement that reinforced the walls in some of the sections, and the Hellenistic period walls on the lower layer. A closer detail of the wall is seen below. The Hellenistic floor was built of smoothly dressed, rectangular sandstone stones. They were were placed atop a foundation course of roughly hewn sandstone stones which were arranged next to each other as “headers”. One of the stones seen below is part of a round column. The Phoenicians built the port during the Hellenistic period with the revolutionary underwater cement, which a segment of it is seen below. The findings unearthed along the 15M section included Hellenistic ceramics and coins, dating the pier to the end of the 3rd C BC until 2nd C BC. 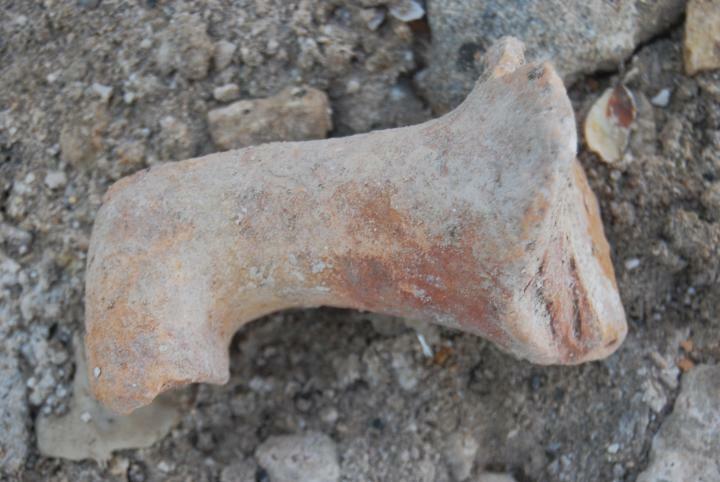 The excavations are headed by Kobi Sharvit, director of the Israel Antiquities Authority Marine Archaeology Unit. For full details - check the IAA report.